Donald Trump is not a joke. After months of denying the reality of his appeal and laughing off the possibility he might be president, Trump’s victories in Florida, Missouri, Illinois and North Carolina on Tuesday have solidified his position as the likely GOP nominee. His staying power has led the pundit class to begin wondering what they missed. One is the persistence of Islamophobia in the United States and the extent to which it drives support for Trump. We used the new American National Election Studies 2016 pilot survey to explore Trump’s persistence. ANES 2016 is a 1,200-person Internet survey performed by YouGov between Jan. 22 and 28 this year that includes a battery of questions about race. Though online surveys have drawn some minor criticisms, leading political scientists Stephen Ansolabehere and Brian Schaffner have shown that opt-in panel surveys are just as reliable as telephone surveys. Our results are dramatic. 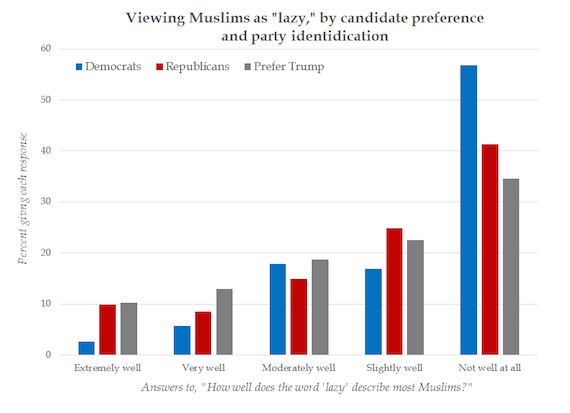 More than a quarter of Trump supporters say that the word “lazy” describes Muslims “extremely” or “very” well, compared with about one-fifth of Republicans and less than one-tenth of Democrats. More than half of Democrats say the word describes Muslims “not well at all,” compared with about a third of Trump supporters. 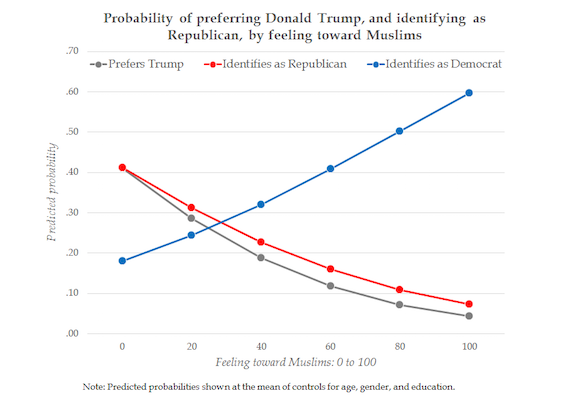 While Trump supporters were slightly more likely to stereotype Muslims as lazy, they were dramatically more likely to stereotype Muslims as violent. 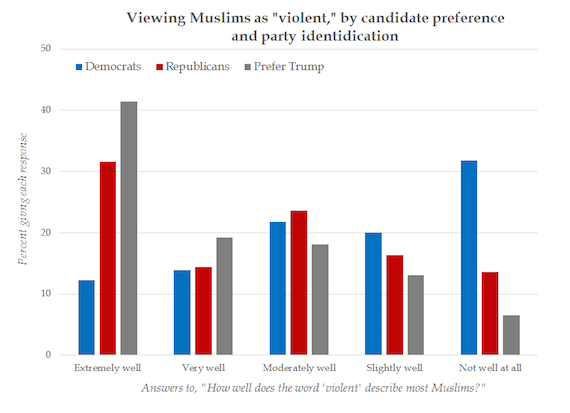 A stunning 60 percent of Trump supporters say the word "violent" describes Muslims “very” or “extremely” well. For comparison, only 7 percent of Trump supporters said that the word "violent" describes white people extremely or very well. Nearly half of Republicans agree, compared with a bit more than a quarter of Democrats. Only 7 percent of Trump supporters said that the word “violent” describes Muslims “not well at all,” compared with about a quarter of Democrats. Widespread Islamophobia also helps explain why even the most extreme anti-Muslim rhetoric hasn’t harmed Republican candidates. Though it is easy to single out Trump for approvingly citing a right-wing myth about executing Muslims with bullets dipped in pig’s blood, the comments of mainstream GOP candidates have been nearly as disturbing. In an interview after Trump’s call for a ban on Muslims entering the United States, Ted Cruz called for restricting entry from some countries, but with exemptions that Greg Sargent reports were “widely seen as an effort to exempt from the ban refugees who are Christian or non-Muslim.” Marco Rubio, often seen as a moderate on the right, likewise tried to downplay hostility toward Muslims, while emphasizing what he described as a bias in the Obama administration against Christians. 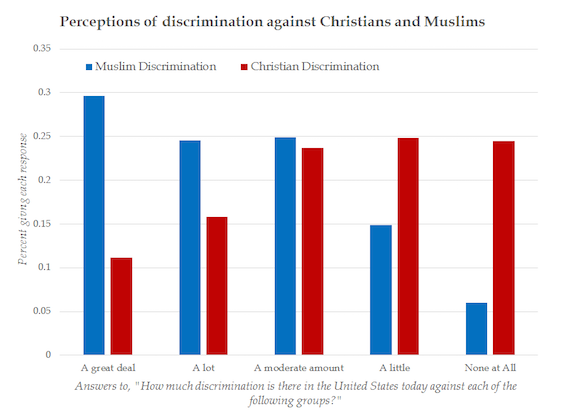 It’s worth noting that according to ANES 2016, respondents were far more likely to perceive discrimination against Muslims than Christians (see chart). According to ANES 2016, the mean feeling score for Muslims was 50, dramatically lower than the mean score for Whites, 72. A study on the controversy finds those who relied heavily on Fox News were more likely to believe false rumors about the cultural center and mosque—for example, that the imam who supported it was a terrorist sympathizer. That is, Bush’s language “was operating more in the register of a dog whistle, a way to advance a basically racial message while still maintaining plausible deniability.” Even today, Bush is seen as more moderate on issues related to Islamophobia. But the aggressive domestic surveillance policies he pursued, and the rhetoric of the last few years indicate Islamophobia was ripe on the right. Trump is just the most successful politician to date at picking the fruit. Philip Cohen is a sociologist at the University of Maryland, who runs the blog Family Inequality. Follow him on Twitter at @familyunequal. Philip Cohen is a sociologist at the University of Maryland who runs a blog called “Family Inequality.” His twitter handle is @familyunequal.